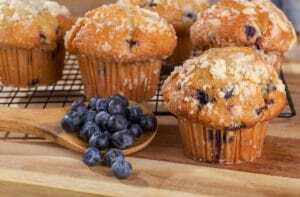 The tasty Lakes Region Bed & Breakfast Association Annual Muffin & Scone Tour happens April 27th and 28th. Don’t miss this delectable journey to six charming New Hampshire Bed and Breakfasts. Of course we at The Lake House at Ferry Point Inn are showing off our baking talents again this year. As one of the participating Bed and Breakfasts, each guest staying with us receives a ticket to the tour. It also enters you to win a prize of one-night at one of the inn’s or a gift certificate and gift basket from King Arthur Flour. To make the weekend even more tempting, we’re offering 10% off a one-night stay or 20% off a two-night stay. After enjoying a muffin or two…or three, explore the beautiful waterfall hikes that springtime brings every year. Spring is a wonderful time to relax in the Lakes Region and shake off the last of the winter blues. 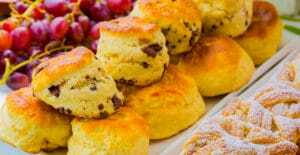 Reserve your muffin and scone getaway with us and wake up to idyllic lakefront views this spring. every delectable meal. Not only do guests enjoy warm, home-baked breads or muffins but alternating sweet and savory meals each day. Some favorites are the grits casserole, flavorful quiches, fresh fruit French toast, and breakfast banana splits. All are created with farm fresh local ingredients including New Hampshire’s famous maple syrup. Savor every bite in the lovely dining room overlooking glittering Lake Winnisquam. 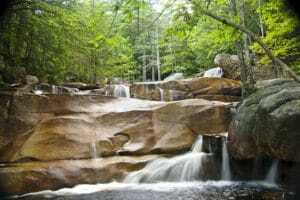 looking for shorter, easier trails take a trip to Glen Ellis Falls, Sabbaday Falls, Lower Falls and Diana’s Bath. While Arethusa Falls and Champney Falls are worth the more challenging hikes. So toss a muffin in your backpack and discover these amazing spring waterfalls. Come visit us for the muffin and scone tour, spring hiking or simply to enjoy the beautiful lake views from our gazebo. Our classic, comfortable, private suites will have you relaxed and refreshed. Wake up each morning to the lovely views and delicious breakfast. After your adventures in the Lakes Region, return to our tranquil retreat on Lake Winnisquam. We’ll have a fire crackling and a plate of home baked cookies ready. Book your spring escape with us today.